Last month, in the Daily Bulletin, we talked about twist rate and muzzle velocity. That discussion was based on a detailed study published in Modern Advancements in Long Range Shooting. In this article, we look at how twist rate and stability affect the Ballistic Coefficient (BC) of a bullet. Again, this topic is covered in detail in the Modern Advancements book. Through our testing, we’ve learned that adequate spin-stabilization is important to achieving the best BC (and lowest drag). In other words, if you don’t spin your bullets fast enough (with sufficient twist rate), the BC of your bullets may be less than optimal. That means, in practical terms, that your bullets drop more quickly and deflect more in the wind (other factors being equal). Spin your bullets faster, and you can optimize your BC for best performance. Applied Ballistics used multiple barrels to study how twist rate affects BC. Barrel twist rate along with velocity, atmospherics, and bullet design all combine to result in a Gyroscopic Stability Factor (SG). It’s the SG that actually correlates to BC. The testing revealed that if you get SG above 1.5, the BC may improve slightly with faster twist (higher SG), but it’s very difficult to see. However, BC drops off very quickly for SGs below 1.5. This can be seen in the figure below from Modern Advancements in Long Range Shooting. The chart shows that when the Gyroscopic Stability Factor (SG) is above 1.5, BC is mostly constant. But if SG falls below 1.5, BC drops off dramatically. Note that the BC drops by about 3% for every 0.1 that SG falls below 1.5. The data supports a correlation coefficient of 0.87 for this relationship. That means the 3% per 0.1 unit of SG is an accurate trend, but isn’t necessarily exact for every scenario. It’s a common assumption that if a shooter is seeing great groups and round holes, that he’s seeing the full potential BC of the bullets. These tests did not support that assumption. It’s quite common to shoot very tight groups and have round bullet holes while your BC is compromised by as much as 10% or more. This is probably the most practical and important take-away from this test. 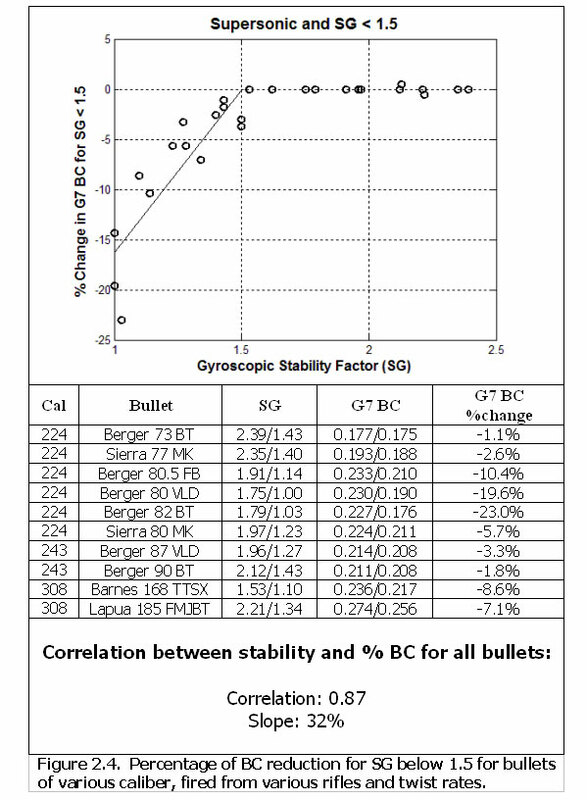 To calculate the SG of your bullets in your rifle, visit the Berger Bullets online stability calculator. This FREE calculator will show you the SG of your bullets, as well as indicate if your BC will be compromised (and by how much) if the SG is below 1.5. With the stated twist rate of your barrel, if your selected bullet shows an SG of 1.5 (or less), the calculator will suggest alternate bullets that will fully stabilize in your rifle. This valuable online resource is based directly on live fire testing. You can use the SG Calculator for free on the web — you don’t need to download software. This article is just a brief overview of the interrelated subjects of twist rate, Gyroscopic Stability, and BC. The coverage of twist rates in Modern Advancements in Long-Range Shooting is more detailed, with multiple live fire tests. Other sections of the book include: Modern Rifles, Scopes, and Bullets as well as Advancements in Predictive Modeling. 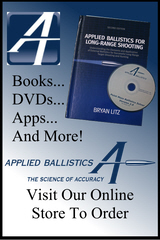 This book is sold through the Applied Ballistics online store. 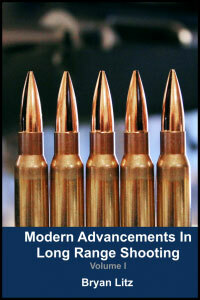 Modern Advancements in Long Range Shooting is also available in eBook format in the Amazon Kindle store. Share the post "How Ballistic Coefficent Varies with Twist Rate (Stabilization)"
Tired of paying hefty fees to Gunbroker.com? Well there’s a new auction website, GunPalace.com, that lets you sell guns and gear at low cost (basic listings are free). 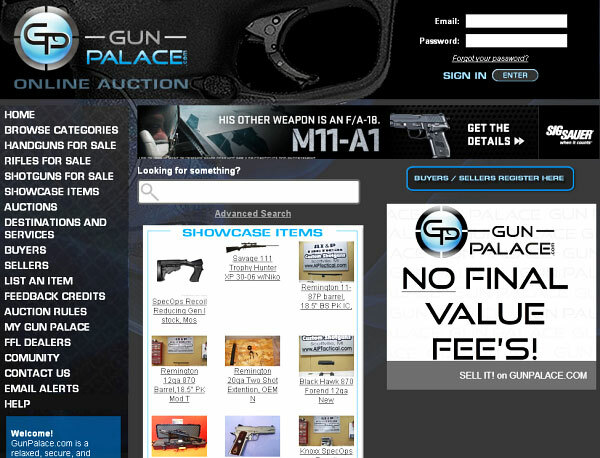 Notably, GunPalace.com does not charge the typical final sales fees imposed by most auction sites. (Those charges could total $70 or more for a $4000.00 rifle). On GunPalace.com it is easy to list and sell handguns, rifles, shotguns, ammo, collectible items and more. Auction categories for sellers include: all types of guns (including rare and collectibles), plus gun parts, gun accessories, ammo, optics, safes, knives, hunting gear, military items, camping gear, ATVs, motorsports, and more. It is easy to register to begin listing items for auction. GunPalace.com doesn’t eat away your profits, as you pay zero final sales fees. Share the post "New Gun Auction Website Offers Free Basic Listings"
If you’ve ever used a Harris Swivel Bipod, you know that, without tools, it is difficult to put enough tension on the swivel locking knob to really lock the unit solid. And, if you do manage to get the knob really tight (perhaps by using pliers), it is difficult to loosen with fingers alone. That was why Terry Cross and the folks at KMW Long Range Solutions invented the Pod-Loc™. 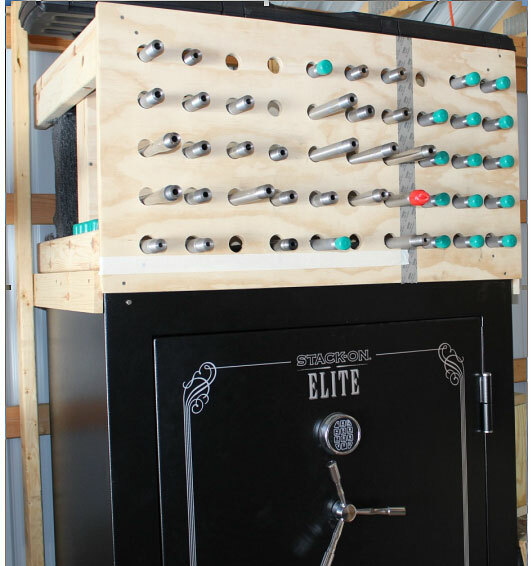 This system replaces the knurled swivel tension knob with a push-button adjustable handle. Using the handle you can easily set the swivel tension at any level from loose to “rock solid”. And you can release tension to adjust the bipod to different terrain just as easily. 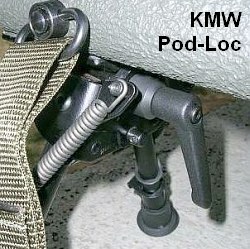 The KMW Pod-Loc™ retails for $24.99 at Brownells.com and Sinclair Int’l. While we use genuine KMW Pod-Locs on our rifles, readers on a tight budget, or who have a large collection of bipod-equipped rifles, can economize by putting together their own swivel locking systems from off-the-shelf components. You need two parts per installation: a push-button swivel handle and a 3/16″ spacer. Levers and spacers are both available online from www.T-Nuts.com. The spacer is part #SS1 ($1.00). T-Nuts offers a variety of suitable handles, ranging in price from $7.00 to $10.00. So, by sourcing the parts, you can outfit three bipods with swivel adjusters for the cost of one Pod-Loc. We recommend the Nylon/Stainless BPL/NS model ($7.70), but you may prefer the all-metal BPL-Z ($8.50), or the shorter BPL-Micro model ($8.50). The compact Micro lock does not protrude past the body of the bipod, yet is still easily grasped. 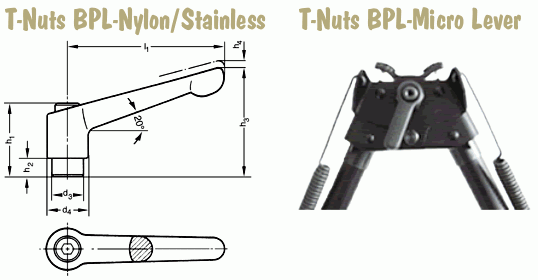 T-Nuts supplies one 3/16″ spacer with most of its bipod handles. T-Nuts handles are also available with a metric M6x1.0 thread for use with imported bipods such as Outers and Rockport. To install a swivel locking system, first you’ll need a 1/4″ socket to remove the keeper nut from the threaded pivot rod. (During this process, you’ll need to keep pressure on the pivot rod retaining pin on the opposite side of the bipod.) Don’t try to remove the keeper nut with pliers or an open-end wrench. You really need the correct socket. Once that keeper nut is removed, then unscrew the knurled tension knob/ring. This is attached to the same threaded shaft as the keeper nut but you should be able to remove it without tools. After the knurled tension ring is off, it is easy to put your handle on the bipod. First slip the 3/16″ spacer over the threaded pivot rod. Keeping finger pressure on the pivot rod retaining pin (on reverse side), then spin on the T-Nuts handle. Rotate the handle inwards until it firmly locks the bipod swivel mechanism. By pushing the button in the head of the handle, you can swing the handle left or right to set its position without altering the swivel tension. Share the post "Swivel Bipod Locking Handle Options"